← THE HACKING TSUNAMI HITS TURKISH AND AUSTRALIAN WEBSITES: MORE HACKING TO COME? Taylan Kulaçoğlu who was taken in custody earlier for allegedly being member of online hacktivist group RedHack has been sent to prison for further processing after his second detention this afternoon. According to Turkish news website, Taylan will now be transferred to Ankara for his arrest order to take effect after spending the night in Metris Prison, Istanbul. My brother will be transferred to Ankara within 24 hours, we would like to feel that we are not alone. I hope my brother’s arrest will be forgotten among Turkey’s chaotic chain of events. Taylan Kulaçoğlu is a Turkish citizen who was taken in custody and accused of being member of RedHack going with the handle of Manyak (Maniac), hence sent to prison. Police claimed that Taylan is one of the founder of RedHack which is a Marxist-Leninist hacking group that describes itself as the‘voice of the oppressed.’ It has more than 700,000 followers on Twitter. RedHack is angry and disappointed over Taylan Kulaçoğlu’s arrest, claiming that government of Turkey is arresting innocent people having no connection with online hacktivists whatsoever. 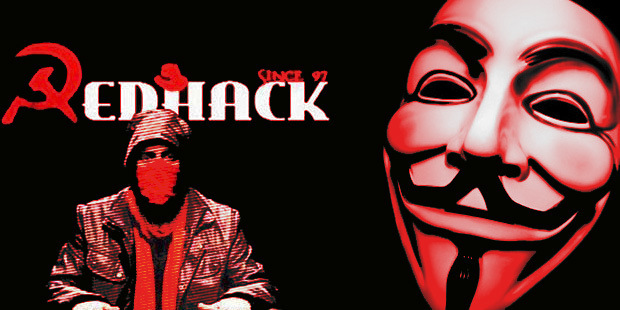 It was an act of retaliation in which RedHack had hacked and defaced the official website of Turkish Ruling Party AKP website against Taylan Kulaçoğlu arrest, denying his affiliation with the group. In an exclusive discussion with RedHack, author was told that the group will not sit behind and watch, it will instead stand strong with all innocent youth in Turkey and around the world whenever someone will try to jail in the name of RedHack. The State in Turkey have organised against it’s own people. Dissident struggle is under serious threat. Demanding freedom and justice for the humanity is the backbone of the struggle and this struggle will continue until we wipe the puppets and dictators on this land. Because we own it to the people in the region. Therefore support from out of Turkey is what we need at this present time. People practicing their right to freedom speech and freedom of assembly is threatened with arbitrary arrests and prison. Law has lost it’s legitimacy and thats why dictator PM Erdogan openly wages war against people who criticizes his ill fated politics of divide and rule. Redhack is not an ordinary hacking group. It is a Turkish Marxist–Leninist hacktivist group which was founded in 1997 making its name all over the world after hacking Turkish government websites and supporting Gezi Park protests in Turkey. Considering RedHack’s skills and ideology, Turkish government now may face tough time from the group. It can be online protest, cyber attacks or ground protest against the arrest of Taylan Kulaçoğlu.